I thought the flower stamp in the Baroque Motifs set was a close match to the flowers on the embossed piece, so I made my own DP by stamping them on the white cardstock using the Platinum Shimmer Paint with a sponge dauber to ink the stamp. Me likey! 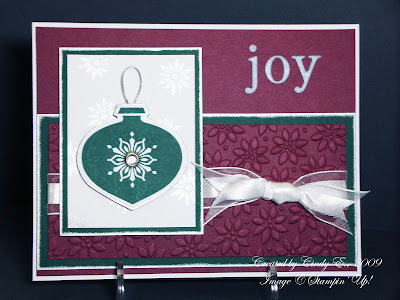 See my post here for some tips on embossing with the Petals-A-Plenty Impressions folder. Gorgeous! You are so funny - I wish I were a Boggle Master!